Whatever cooking method you use, remember that thicker pieces of fish will need longer times and thinner pieces the shorter times. This and foil cookery is a trouble-free way of cooking certain fish because, as long as you put on a timer, you can pop it in the oven and forget all about it. Having said that, though, there are one or two things to be wary of. White fish, steaks and fillets on their own could end up being dry so these are best brushed liberally with melted butter and protected with a buttered piece of foil lightly placed on top. However, if you use a topping to add moisture, the foil is not needed. Whole fish oven-bake beautifully if brushed liberally with butter or oil, and if a little stuffing is added to the body cavity this will help to keep the fish moist. * Preheat the oven to gas mark 6, 400°F, 200°C. 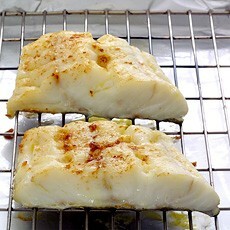 * White fish or smoked fish fillets and steaks brushed with buttered foil weighing 6-7 oz (175-200 g): 15-20 minutes. * Whole mackerel, trout or herring weighing 10-12 oz (275-350 g) each: 25-30 minutes. * Tilapia weighing 12-14 oz (350-400 g): 15 minutes. 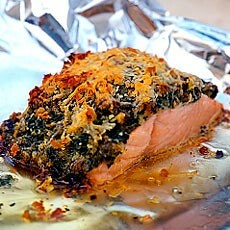 You can, if you wish wrap fish in foil and then cook it in a steamer, under the grill, on the barbeque or in the oven. The advantage is that all the essential flavours and juices are retained inside a sealed parcel. It’s best to follow individual recipes for trimmings but I have found that foil-wrapping is the very best way to cook either a whole or a large piece of salmon or a salmon trout, and if in the summer you want to serve it cold you can leave the fish in its parcel until you’re ready to serve it, in which case it will be very moist and juicy. I like the slow method, which gently cooks the fish to absolute perfection. If you want to cook a whole salmon for a party the fish can be cut in half, wrapped in two foil parcels then, after baking and cooling, the two halves can be put back together once the skin has been removed and the joint hidden by a band of cucumber slices. The oven temperature for this is gas mark 1, 275°F (130°C). Add two bay leaves to the body cavity and some sprigs of fresh tarragon, season with salt and pepper and tuck in 1-2 oz (25-50 g) butter. Then wrap the whole thing in a double sheet of foil, loosely but sealing it tightly, place the parcel on a baking sheet and bake in a pre-heated oven for the following cooking times. Whole salmon trout can be prepared as above and cooked with the same timings according to weight. Salmon steaks weighing up to 6-8 oz (175-225 g) each need to be baked at a higher temperature than this: gas mark 4, 350°F, 180°C. Wrap them – either individually or 4-6 at a time – in well-buttered foil, but first season them, adding sprigs of tarragon, torn bay leaves and 1 tablespoon white wine per steak. Seal the edges of the foil securely and bake on a high shelf for 20 minutes. Salmon fillets weighing 5-6 oz (150-175 g) each will take 15-20 minutes. When using a barbecue, have some melted butter handy to brush on the fish. It’s best to use one of the special fish grills available as this keeps the fish neatly intact without it breaking or sticking. 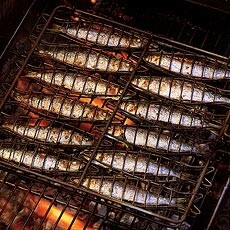 Trout, mackerel and other small, whole fish all respond well to barbecuing and you can add herbs and seasonings. This is a tricky subject, and one that caused a great dilemma for the cookery writer. As microwave ovens are not standard and the power levels vary, it’s difficult to give any standard guidelines. The best course if you want to cook fish in the microwave is to follow the instructions found in the individual manufacturer’s handbook. But the danger with cooking fish is that a few seconds more than it actually needs will render it overcooked and sometimes dry. For this reason I think cooking fish in a microwave is not at all easy for beginners and, because conventional cooking is quick and easy anyway, I would begin with this.